Fish and shellfish are easy to prepare and swimming with nutritive value. Fish and shellfish have become an even more important part of the diet as people turn to more healthful eating. People are choosing fish and shellfish more for several reasons. It is economical, versatile, high in nutritive value, quick and easy to prepare, and it tastes good. When purchasing fish, look for bright, clear, bulging eyes; reddish or pink gills, tight, shiny scales; firm, elastic flesh that springs back when pressed; and a pleasant saltwater-like odor. Fish and shellfish are best if cooked the day of purchase but can be stored no more than two days in the coldest part of the refrigerator, preferable on ice. Frozen fish and shellfish should be kept solidly frozen until ready to thaw. 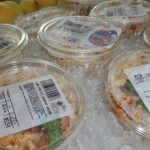 Frozen seafood will remain fresh for four to six months. Cook seafood immediately upon thawing. Do not thaw fish at room temperature or in warm water because it loses moisture and flavor. Never refreeze uncooked fish. Most fish and shellfish can be cooked using a variety of methods. Fish and seafood can be broiled, grilled, deep-fried, poached, steamed, baked, pan-fried, and sautéed. Care must be taken not to overcook fish or seafood. Fish are done when the flesh, pierced at its thickest point with a fork flakes easily, and flesh turns from translucent to opaque. Proper cooking develops flavor, softens connective tissue and makes protein easier to digest. Many seafood aficionados prefer flavoring their dishes with small amounts of salt, pepper, and occasionally lemon. The delicate taste of seafood blends exceptionally well with a variety of herbs, spices, and seeds, as long as these seasonings are used sparingly. The next you are in the neighborhood of your local seafood market, stop in. 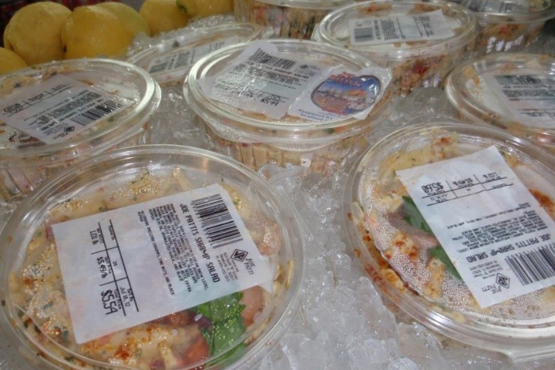 Remember that fish and shellfish from the Gulf are nutritious, economical, quick and easy to prepare, and taste great. So, enjoy local fish and seafood today. Thaw frozen fillets. Cut fillets into 6 portions. Place fish in a single layer, skin side down, in a well-greased baking dish, 12 x 8 x 2 inches. Combine remaining ingredients. Pour sauce over fish. Bake in a moderate oven, 350° Fahrenheit, for 20 to 25 minutes or until fish flakes easily when tested with a fork. Makes 6 serving. Thaw frozen shrimp. Alternate shrimp, bacon, mushrooms, and green pepper on 48 skewers or round toothpicks, approximately 3 inches long. Place kabobs on a well-greased broiler pan. Combine remaining ingredients. Pour half of the sauce over kabobs. Broil about 4 inches from source of heat for 5 to 7 minutes. Turn carefully and baste with remaining sauce. Broil 5 to 7 minutes longer or until shrimp are pink and tender. Makes approximately 48 hors d’oeuvres.